Time for a new challenge board! I went with enamel dots - plaid - baby for my inspiration card. 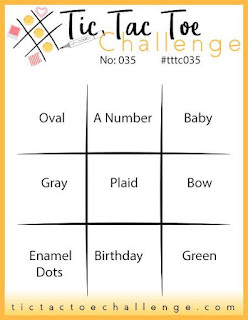 If you have yet to play along in the challenge, I encourage you to jump in! My sister recently adopted a very special baby boy and I'm going to go see her this weekend! So I had her in mind when I created this card. 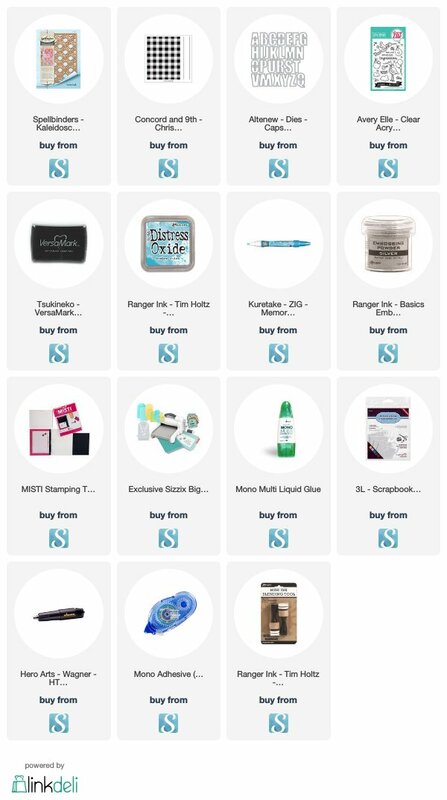 Disclosure: affiliate links have been used in this post - If you use these links to purchase products used in this project I make a small commission at no additional cost to you. I appreciate the support if I have inspired you with my designs to continue bringing you inspiration. 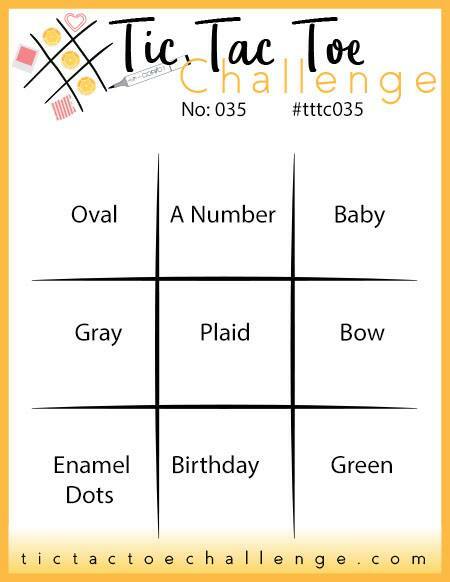 Here's the challenge board - if you'd like to check out the other awesome DT inspiration projects, click here. If you already read my blog you have probably noticed it's been a busy week already with 3 posts! If you'd like to check this out you still have time to check out this huge video hop (I'm participating in). There are a whole ton of prizes offered at EACH stop - so if you need to binge this weekend on crafty inspiration from YouTube artists instead of Netflix and chill you can also find details on Justine Hovey's blog. Back to today's card. You know me - I love to mix and match different companies to see what happens. Sometimes this works out well and if it doesn't you won't see it here (grin). The die cut letters were made from a plaid pattern background that I stamped myself with the Concord & 9th plaid background stamp in blue and embossed silver stripes. I die cut the letters with my new and totally awesome Altenew Bold Caps Alphabet (folks I'm serious this is a new staple in my craft room). The one thing that I found challenging was the plaid background. I wanted a softer color and while I would usually turn to my Catherine Pooler inks, the only blue I had is darker than I wanted. Since Distress Oxides are much better than the regular ones at stamping I went with Blue China for the color. The MISTI is wonderful for stamping these types of stamps, but this was one of those times where I had better results putting the paper down on top of the stamp and pressing the paper into the stamp. So if you've had trouble with bigger stamps even with a stamping platform, you can always try what stampers have done for ages and do it the old fashioned way. If I had time to do this over again I would not stamp the Avery Elle banner I used today onto vellum and colored with a dark gray alcohol marker where the words are to make them more legible. I tried a few different ways and this was still the one that came out the best. Solid stamps like this one can take some trial and error to figure out what works best. I am committed to keep trying and see how to make it look it's best because I think that banner is too adorable! Thanks for reading! Have a great weekend! I will be in New Braunfels on Saturday to take a coloring class from "The" Kathy from The Daily Marker and Lydia from Understand Blue. I imagine I will have a lot of fun things to share after my trip.